The ultimate ephemeral city comes to life once a year in the remote city of Harbin, Heilongjiang, China. 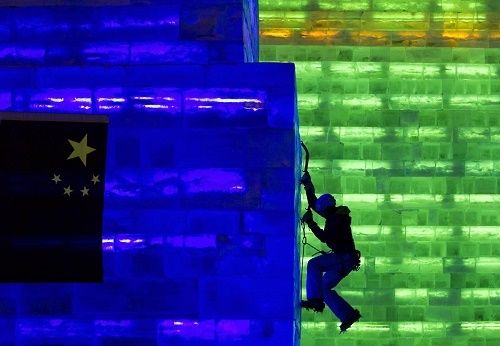 For the past 30 years the frozen skyscrapers emerge with the help of over 10,000 artists and more than 180,000 cubic meters of ice cut from the Songhua River. A collective 28 million visitors descend upon the monuments spread over 600,000 square meters of ground before it ultimately melts away. It is an engineering spectacle in light and ice. Immense frozen palaces, pyramids and churches are part of the skyline, some even containing amenities such as escalators. Temperatures in the region can plummet to minus 28 degrees, ensuring the structures remain solid for days in the bitter cold. These extremes in weather also allow for the extensive illumination of this translucent sprawl. When the night descends upon the city, the ice glows in a bright array of colour. The harvested blocks are fitted with LED tube lights by embedding them into a recess in the ice. LED illumination is more suited as they give off little heat, having reduced impact on the melting of the block. Deionised water is also used in producing some of the ice features, making them clear sculptures rather than translucent ones – changing the intensity of light in different areas. The practicality of building with ice is mostly limited to constraints of maintaining an ambient temperature below 0˚C. It is usually not suitable for long term habitation and not ideal for structural use due to its characteristic of melting and re-freezing. Usually seen as ornamental, ice is the ultimate perishable building material. However, a group of university students from Eindhoven University are employing some old, almost sci-fi ideas, to build a 1:5 scale model of Gaudi’s towers of Sagrada Familia in Finland. The building material they are using is called Pykrete, which is made up of a composite of 14% wood pulp and 86% ice. Winston Churchill’s 2.2 million ton pykrete aircraft carrier that would have been 1200 meters long and 180 meters wide. It was conceived of during World War II by Geoffrey Pyke of the British Royal Navy. He proposed it as a solution for making huge, unsinkable aircraft carriers. Its potential lay in its characteristic of having a relatively slow melting rate, due to the low thermal conductivity, and its improved strength makes the material three times as strong as normal ice. 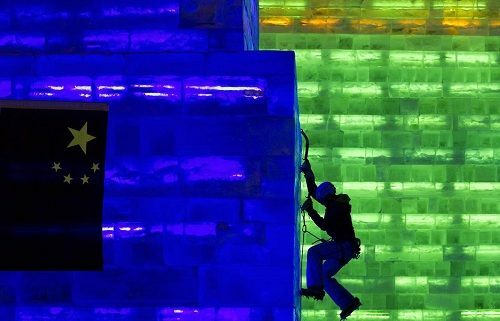 Eindhoven University unveiled their ice manifestation during January, with the tallest tower reaching 21 meters. They constructed them using thin layers of water and snow that were sprayed onto large, inflated moulds. The interesting implication of this project is the ability to take a material such as ice and vary its translucency within the structure. It becomes a building that is not only reliant on a temperate zone, but a structure that is constantly changing its quality of light as its state responds to its surrounds. It becomes a building that is a live painting – with light.